Won't that be cute though!?! And Brittany's card? Isn't it so cute? She totally could have sent that in a regular old white envelope, but instead she decided to send a little extra love along with her Benjamin. She is so sweet! These are the first 2 out of 20 blocks I will be making for a sampler I started last month. This is a project that the Alpine Quilt Guild is doing this year. All of the blocks have to do with Alpine in some way. The church is based off of the red brick church that the quilt guild has been meeting in for 20 years. But, as you can see, mine is orange. The star is called The Sherriff's Nine Patch (hey, every town has a sherriff right?) We've also been given patterns for Delectable Mountains (which I am considering tossing out because it is giving me fits) and a Scrappy Log Cabin. I am really excited about this quilt. It's fun picking different fabrics for each block. I just wish they would give us all of the patterns now, instead of month by month! 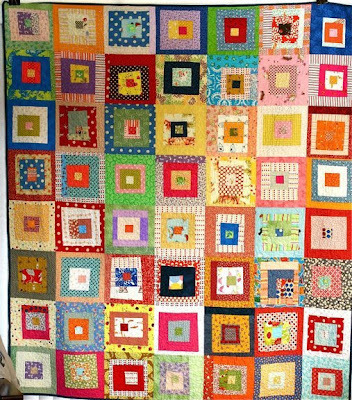 Another thing the Alpine Quilt Guild has going on right now is a block exchange in blues, browns and pinks. So I hopped on board with that one because I saw some samples of finished products using those colors and blocks and they were gorgeous! Ambs, why are you so amazing? Always working on a million projects. Yes, I have a million things I THINK about doing, but do I actually get off my lazyx#$& and do them? No. You're truly an inspiration! So cute Amber. I am inspired. I ditto Keri, I can't seem to get going either, I just dream them up, although I saw a quilt off of one of the blogs you visit that I would totally love to do. Hopefully sooner than later. You're awesome! Seriously, you are a busy bee. Love it though - all the cute things you do. You motivate me to get things done. Thanks for the sweet notes. You are always so encouraging. 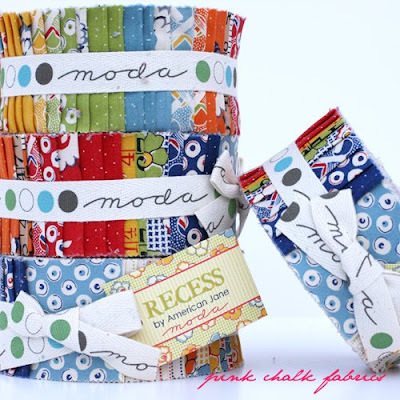 Can't wait to see that cute quilt, love the vibrant fabrics! BTW, you should do the scrap apron theme on Angry Chicken's Tie one On!